I have a simple Logitech mouse with 2 buttons and central wheel button. The central button opens some accessories (calculator and so on). I would like this button to open new links in chrome (as it does on Windows and Linux). Is there a way to configure that? I've tried Logitech control center, but it can't find the attached mouse. This is not a feature provided by OSX. If you want to open a link in a new tab you ⌘+click the link. This also works with the URL-bar and search box using ⌘+↩. 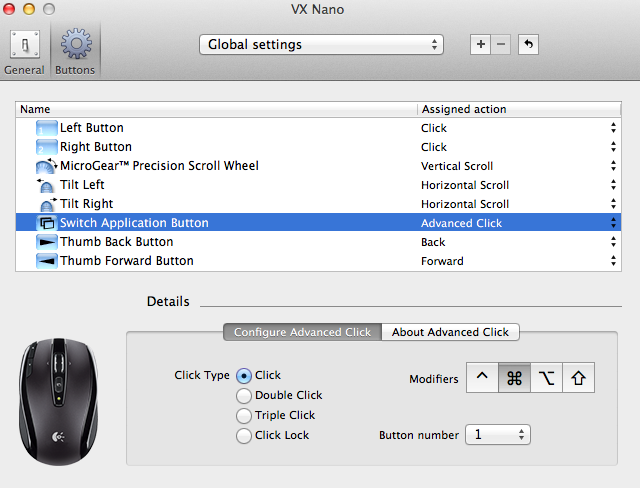 Knowing this, you can assign the ⌘+click action to the scrolling wheel click using the free software BetterTouchTool. You can set the center mouse button or any other button to open links in a new tab in Logitech Control Center. Just change the Assigned action of the "Switch Application Button" or "Center Mouse" button to "Advanced click." Under the "Configure Advanced Click" tab, select "click" under click type and select the "⌘" modifier.